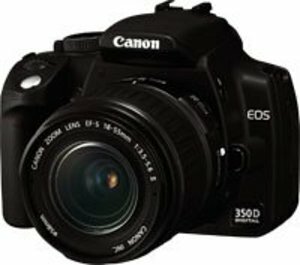 This is my new little baby, the Canon 350D, coming in the post within the next day or so. It's actually partly my birthday present from Morgane, partly a treat to myself that I've been promising myself since last December when I saw Ben taking some great shots at Les Blogs 2.0 and around Florence, where the lucky sod lives. Should make keeping ScottishDailyPhoto up-to-date much more interesting.